"In a snap, white winter comes. Snow falls down and cold wind numbs. the taste of something great. " What is it about squirrels? We have one or two in the neighborhood, running along the utility lines in the back lane all year round. A neighbor provides peanuts, another neighbor offers a backyard tree, and the rest of us provide the roofs of our houses for romping and jumping. It's fun to watch! 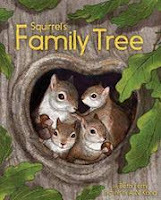 This appealing information book will be much appreciated by little ones who want to know more about the squirrels they see in their own neighborhoods or on forest walks. It is easy to hear them chatter away as you near their nests and to watch them as they industriously help forests survive and thrive. They do a remarkable job of that, as is mentioned in a quote in front matter. In rhyming text, Ms. Ferry shows her readers how the squirrel's presence helps to keep oak trees growing in forested areas. As they gather and bury acorns in the fall, they ensure a plentiful food supply through the long, cold winter. Spring brings new babies that follow in the footsteps of their parents. The acorns not found remain to germinate and perhaps grow another tree. "But many seeds she can't locate. Her tummy will just have to wait. if found a bit too late." So, the oak provides the seeds that sustain squirrel life, and squirrels stash seeds in places where they are not always found, and can grow another tree. It's a neverending cycle of life. In back matter a list of "Nutty Facts" is provided, offering little additional tidbits of information. "It is estimated that only one in 10,000 acorns becomes a mature oak tree." "Tree squirrels fail to recover approximately 74% of the nuts they bury; therefore they are really planting hundreds of new oak trees." A.N.King uses colored pencil that was scanned and digitally colored to create the warm, earthy images that clearly show the passing of the seasons, and years. Note the young boy and his dog in the first spread on land where few trees are growing, and in the end the old gentleman and his dog among a growing grove of oak trees. Same house, same setting. Lovely!